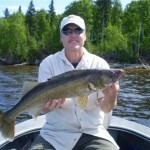 I have been accused of being overly critical in my weekly fishing reports when the weather conditions have been tough. The reason is that I have weeks like this to compare the tough weeks too. 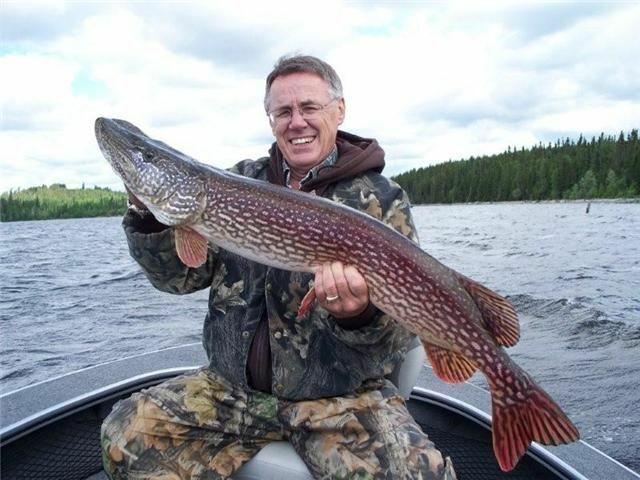 Fishing was fast and furious for all 3 species this week and the only thing that held numbers back from being off the charts was the fact that you had to choose what to fish for. 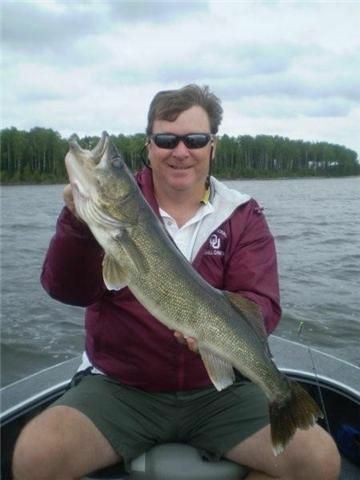 It was a great week for walleye, pike, and smallmouth bass for both volume and size. 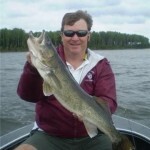 Walleyes pulsed back and forth from a shallow water, super active bite to a 10 – 14 ft. “I’ll bite a jig and minnow if it is in my face.” There were many more fish on typical transition pattern areas, but not all of the usual spots were hot. 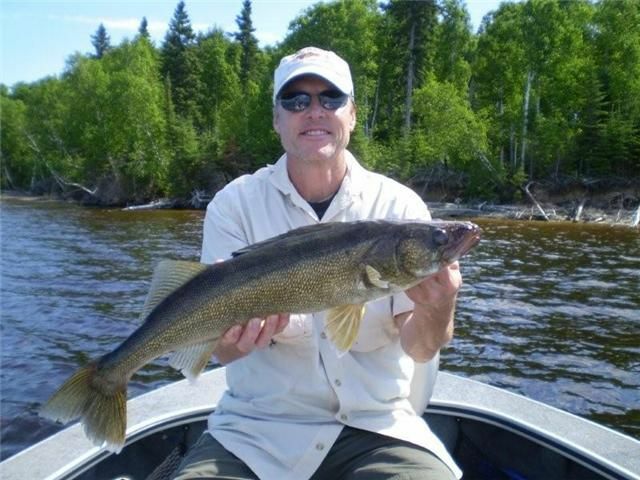 For the week, we had 26 walleyes over 27 in., including 4 – 28s, 2 – 29s, and 1- 30. 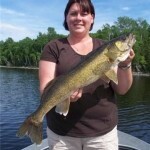 Volume was excellent with daily guide sheets averaging 45 walleyes over 18 in. per day. The highest daily total was 95. 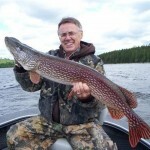 Surprisingly the big Pike bite continued this week with 10 over 37 in., including 3 – 40s, 1 – 41, 1 – 42, and 1 – 43. 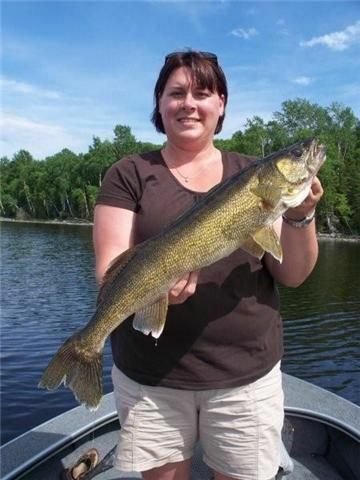 Some were incidental catch while walleye fishing, but others were targeted on transition areas as they made their way from the shallows to the main lake. The Husky Jerk is still a formidable tool, but Gulp Alive Crazy Legs jerk shads on a big jig with a fine wire leader were also hard to beat. Advantage there was that you could catch cross over walleyes in the shallows at the same time. I saved the best for last. 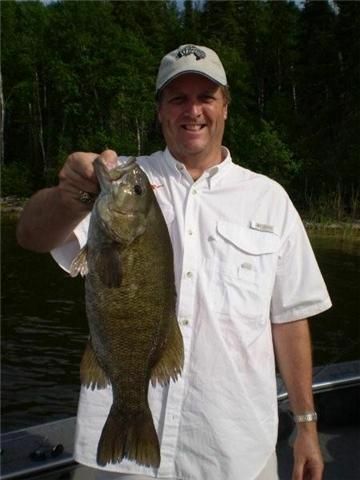 The smallmouth bass bite this week was nothing short of absolutely ridiculous. The Mark Bailey/ Kendal Hartley crew were in from Texas this year and they once again taught the Northern boys a thing or two about catching bass. 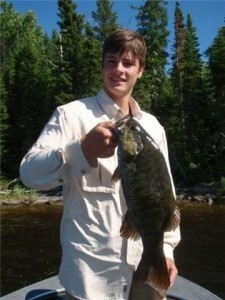 For the week we had 368 bass over 17 in., including 112 – 18s, 23 – 19s, and 1 – 20. 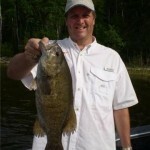 Big tubes with light jigs cast into the shallows were the key. Ring worms and Ring Fry Texas rigged with ¼ oz. bullet weights also turned a massive amount of fish. The best part of the “shared information guide program” is that we can learn something new and immediately pass it on to the entire guide crew so that everyone can take advantage of a short term seasonal pattern. I don’t expect our smallmouth bass bite to last much longer, but we definitely got a great show this week.